In 2014, the Mercedes-Benz V-Class premiere saw a completely new approach to design, value appeal, comfort and safety being introduced into the MPV segment. The concept went on to be a true success: proof of this can be found in the 209 000 or so V-Class units that have been sold since its market launch in 2014, a sales record in 2018 with some 64 000 units, one of the youngest buyer groups at Mercedes-Benz and successful launches in other markets, especially in Asia. At the start of 2019, India was the latest V-Class market to be added to the equation. And the facelift will now make for a refreshing feel to the already successful model. Focal points include a re-styled and striking front-end design, as well as the introduction of the OM 654 four-cylinder diesel engine generation – with the V 300 d reaching the new top value of 176kW. The new Mercedes-Benz Marco Polo makes every holiday trip more fun with its versatile camping features and its driving dynamics. Check out our Snapshot by Mercedes-Benz Vans! Plus, the 9G-Tronic automatic transmission is available for the first time, while safety and assistance systems, among them Active Brake Assist, have been brought up to the latest technological level. Furthermore, Mercedes-Benz Vans is continuing to evolve its eDrive@VANs electrification strategy and will soon be offering a fully-electric MPV. The style and value appeal of the V-Class lead the way in the MPV segment. It's designers in Stuttgart have used a series of targeted measures to give the MPV a new look which follows the design idiom of the current Mercedes-Benz passenger cars. Whether you’re heading out on a road trip, business trip or an extended family vacation, the Mercedes-Benz V-Class is a vehicle for every occasion. 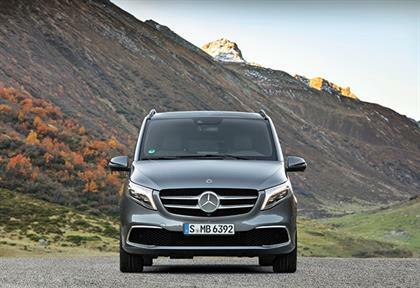 Check out the new V-Class in our Snapshot by Mercedes-Benz Vans! It has a broader appearance and an even stronger visual presence thanks to its new front end. This comes courtesy of a new bumper design with striking cooling air inlets and a new diamond structure in the radiator grille. The Mercedes star is positioned centrally in the radiator grille and framed by two slats in silver. The personalisation concept with the attractive Avantgarde and Exclusive lines continue to exist, while the AMG Line will become visually more powerful: it features a new diamond radiator grille with chrome pins and thus delivers a sporty note. New paint colours in graphite grey metallic and selenite grey metallic expand the spectrum of the well-received black/white tones. Equally new is the optional paint colour steel blue. With the new colour hyacinth red metallic, it also optionally makes an especially emotive statement. At the same time, the four new light-alloy wheel designs ensure a powerful and avant-garde appearance. They include 5-twin-spoke 17" light-alloy wheels painted in black with a high-sheen finish as well as 18" light-alloy wheels in tremolite grey with a high-sheen finish and 5-twin-spoke design or in black with a high-sheen finish and 5-spoke design. At the upper end of the new wheels portfolio are black-painted 19" 10-spoke light-alloy wheels with a high-sheen finish. In the interior, too, the designers have been busy, transposing the interior design philosophy of the current Mercedes-Benz passenger car models into the new V-Class. The interior of the MPV follows the trend of modernity and clarity. In line with the facelift, the facelift presents itself with new air vents in a more sporty turbine look as well as new dials in the instrument cluster. Thanks to the reduced design, drivers can orientate themselves much more simply. In the acceleration phase, the V 300 d can briefly deliver an additional 30Nm of torque ("overtorque") in addition to its 500Nm of torque. The V 300 d accelerates from 0 to 100km/h in 7.9 seconds, with a top speed of 220km/h. Among the innovative characteristics of the new engine, generation is the combination of an aluminium housing and steel pistons, the stepped recess combustion process and Nanoslide cylinder wall coating for reducing friction within the engine. How efficient these measures are can be seen on the basis of the fuel savings of around 13% which the V 250 d can boast in comparison with its predecessor model. The majority of components relevant to reducing emission are directly installed on the engine. The integrated technological approach comprising a new stepped recess combustion process, dynamic multiway exhaust gas recirculation and close-coupled exhaust gas after treatment facilitates low consumption with low emissions. Thanks to the near-engine, insulated position of the components, the exhaust-gas after treatment system enjoys low heat loss and advantageous working conditions. The facelift will also see the V-Class optionally equipped with the 9G-Tronic automatic transmission for the first time. The particularly comfortable and efficient converter automatic transmission replaces the 7G-Tronic and is available as standard for the V 300 d and V 250 d.
The driver can use the Dynamic Select switch to select the drive programs "Comfort" and "Sport" and thus influence the shifting behaviour. Alternatively, "M" mode allows the driver to shift manually using the Direct Select steering wheel gearshift paddles. All engine variants of the V-Class are equipped as standard with rear-wheel drive, but 4Matic permanent all-wheel drive is available as an option. In this way, it can still move agilely on various types of terrain. The vehicle height remains under the two-metre mark even when equipped with all-wheel drive. Thus the new V-Class doesn't lose any of its daily usability and can still fit in regular garages as well as multi-storey and underground car parks problem-free. In this respect, the new Active Brake Assist can now detect the risk of a collision with a vehicle driving in front and initially initiates a visual and acoustic warning. If the driver reacts, Active Brake Assist increases the brake pressure to suit the requirements of the situation. If the driver fails to react, the system initiates autonomous braking. In urban traffic, the Active Brake Assist also reacts to stationary obstacles or pedestrians crossing. In this way, accidents can be avoided or, at the very least, the consequences thereof reduced. Another new safety feature is the optional Highbeam Assist Plus which is available for the first time in the V-Class. In main-beam mode, Highbeam Assist Plus allows the driver to enjoy a permanent, broad illumination of the roadway without dazzling other road users. In the event of vehicles in front or oncoming traffic, the LEDs of the main-beam module are partially deactivated and thus create a U-shaped cut-out in the cone of light. The remaining areas of the roadway continue to be illuminated with the main-beam headlamps (partial main beam). Be it in terms of style or value appeal, performance and efficiency or safety, the Marco Polo family based on the V-Class will also benefit from the entire scope of the first facelift to the Mercedes-Benz MPV at the same time as the base model. The compact Marco Polo and Marco Polo Horizon campers and leisure vehicles also feature the new front-end design, the new paint colours and light-alloy wheels, as well as the new air vents and upholsteries. They are joined by the new diesel engine with a new peak of 176kW as well as Active Brake Assist and Highbeam Assist Plus. In the MPV segment, Mercedes-Benz Vans will soon be taking the next step and will be the first premium manufacturer to offer a fully-electric model. Thus Mercedes-Benz Vans will consistently expand its comprehensive eDrive@VANs strategy. With the eVito already available and the eSprinter due for market launch in the second half of 2019, the range of fully-electric vehicles will then be extended to include a model series for private use. "With the introduction of the V-Class five years ago, we showed that a stylish and dynamic presence is also possible in XXL format. In doing so, we were able to convince families, leisure adventurers and business customers alike – from Europe right across to Asia. Proof of this can be found in the 209 000 or so V-Class units that have been sold since its market launch as well as in the fact that the vehicle has one of the youngest buyer groups across Mercedes-Benz. "In line with the facelift, the V-Class will receive the Mercedes-Benz OM 654 four-cylinder diesel engine. This is an especially efficient and clean unit. By way of example, in the V 250 d output variant, the fuel savings are greater than 10% in comparison to the predecessor model2.